Whenever I'm sad or feeling gloomy, I only have to think about biking on the KVR (Kettle Valley Railway) and I'm instantly happy. 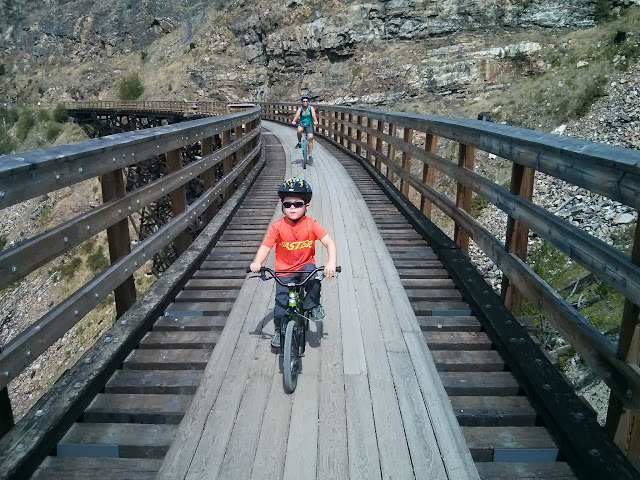 The hot sunny Okanagan region of British Columbia has won my heart and there is no place I'd rather spend my summer in search of new rail trails to ride with my family. 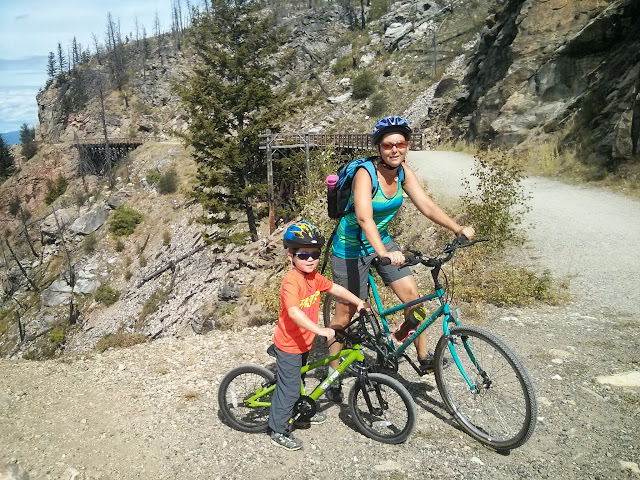 We go to the Okanagan every summer and we've been slowly pedaling our way from Kelowna down to Osoyoos on the KVR, breaking up the trail into small manageable pieces for our now 6 year old son. 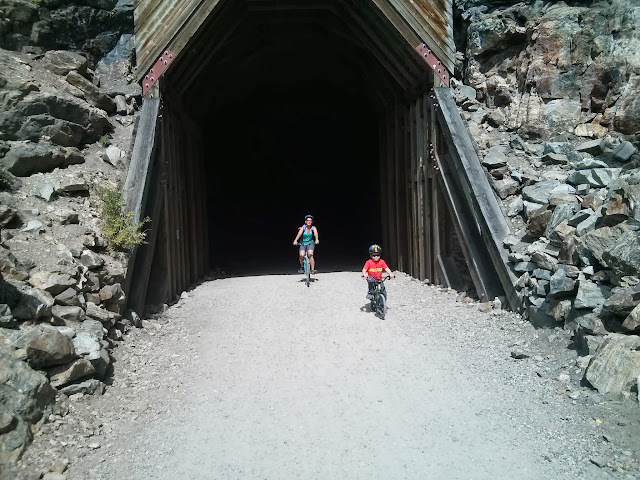 When we started biking these converted railway trails, he was only 4 and we stuck to the easiest section through Myra Canyon. Now that he's a couple years older, we are tackling harder sections and lengthening our rides. This summer, we rode over 60 km on the KVR Rail Trails and summaries are provided below on each ride we have completed so far. For maps, consult the Trail Forks website or app. Starting from Myra Station you will come first to Trestle #18 and then work your way down to Trestle #1 at Ruth Station in a 17 km return ride. (I know it's in reverse order, but most people start their ride at Myra.) While possible to bike the full return distance, most of the trestle bridges are clustered closely together until you reach the third one. From there to Trestle #2, there is a long gap and families with young kids will want to turn around rather than continue on. It is also possible to just go as far as the first tunnel (you'll still get to ride over 7 trestle bridges) or continue on to the second tunnel located before trestle #10. However far you choose to ride, this is an incredible bike ride, and kids will love the bridges and tunnels. On our first visit, we rode as far as the #3 trestle bridge (again, counting down from #18) before turning around. On our second visit we did the full distance to Ruth and had a second car waiting for us. This was extremely enjoyable because the trail goes slightly downhill from Myra to Ruth. The return ride is never steep enough that you'd need gears so don't worry if you choose to do the ride as an out and back. Most people do not set up as second vehicle at Ruth because the two trailheads are located on different roads and it's a bit tricky to set up the shuttle. For more information on this section of the KVR please read my previous story: Biking the Kettle Valley Rail Trail or consult the website for Myra-Bellevue Provincial Park. For a map and driving instructions, it is easiest to pop in at a visitor centre in Penticton or Kelowna. They will give you a full package of printed maps for the KVR. This has become one of my favourite sections of the trail and is definitely easy! You'll be riding downhill at a 2.2% rail grade for most of the ride and will wonder if you were even pedaling for much of it. Stop at Hillside Estate Winery en route and enjoy riding through orchards as you make your way down to Penticton. And, UPDATE for 2018 - there is now a concrete pump track right across the road from the Hillside Estate Winery, right beside the KVR!! The ride from Arawana Road down to Penticton is just under 10 km one way. We finished our ride at the Bench Market while my husband biked back up for the vehicle this year but last year we had a family member drive us back up for the truck. For more information on this ride, please stop at the Penticton Visitor Centre where you can pick up a map and directions. It really is your best resource to finding every trailhead. There is also one trestle bridge on this ride, the McCulloch Trestle, located between Hillside Estate Winery and Penticton. This is an extension to the ride above from Naramata to Penticton and makes for a lovely 22 km bike ride from above the Little Tunnel down to Penticton. Alternately, it would be approximately 12 km if just riding from above the Little Tunnel to Smethurst Road. Many people start at Smethurst Road and bike up to the Little Tunnel. They then turn around and bike back down to the parking lot. And yes, you can do that. It would be 9 km round trip and you would not have to set up a shuttle. However, it is not a lot of fun for children to bike uphill from Smethurst to the Little Tunnel. Most kids I saw were walking and did not appear to be happy! We drove up the Chute Lake Road past Naramata until we got to a parking lot on the Glenfir Loop (it is marked on the map you will get from the Tourist Info. Centre.) From this parking lot we biked downhill to the Little Tunnel (an approximate distance of 5 km.) The trail was a bit rough and sandy until we reached the Little Tunnel but was easy going from there down to the Smethurst Parking lot and beyond to Penticton. The highlight of this ride is of course the Little Tunnel which should be a MUST visit spot on the KVR. For more information on this ride, again please stop in at the Penticton Visitor Centre and pick up the package of maps for the KVR that they give out for free. It is your best resource guide. I had a hard time finding any information on this section of the KVR. The Visitor Centre didn't really know much about it, and some websites even suggested it might not be open. I did therefore what every explorer would do and set out to discover for myself what the ride was like. We drove to the town of Summerland (north of Penticton) and followed directions I found for the Trout Creek Trestle Bridge. We were originally searching for the Fenwick Trailhead but when we got there, were told we would be biking uphill to Trout Creek. I don't know for sure if this is true or not but it scared us off, so we just drove straight to the trestle bridge and started our ride from there. It was easy to find and the trail started as soon as we crossed the bridge. We crossed the trestle bridge and followed the wide easy to follow trail all the way down to the outskirts of Penticton. We continued on the trail until we came upon a gate (where we wondered if we were supposed to pass through or not) and kept going until we came across a second gate. We passed through it as well and ended up on the river channel in Penticton that people float down in tubes. From the channel, we were about 5 minutes upstream from the Silver Grizzly snack bar, across the channel from the Tim Hortons on the main Hwy 97. The ride started with a bit of uphill biking (perhaps another reason my son didn't like it) but then turned flat and downhill as we got closer to Penticton. It's the first ride on the KVR that we have done where I felt I actually had to pedal a fair bit and didn't just get to coast. More information on the bike trails in Summerland can be found on this link to the Summerland Trans Canada Trails System. This might be my favourite section of the KVR that we have ridden so far. I feel as if I'm biking through the desert on this part of the trail and it's always gloriously hot. The trail starts at the far end of the Wrights Beach Camp Campground at lake level. (There is no parking here for visitors so you'll have to park nearby and bike down into the campground.) The first part of the trail from Penticton is a bit overgrown and sandy so we actually skipped it this year and started further along in the Town of Kaleden. Starting in Kaleden actually has several advantages. 1. You will not have to bike through Wrights Beach Camp in Penticton. 2. You will skip the first overgrown part. 3. You will not have to bike through the Banbury Green Campground en route to Kaleden (which I think is really frowned upon.) And 4. You will not have to pick your way through Kaleden on town roads where the KVR disappears. If you start in Kaleden, park near the Ponderosa Point Resort and if you look on Google Maps, you will see the KVR start from there. The full bike ride to Okanagan Falls is approximately 13 km (much shorter if you start in Kaleden) and we always head to Kenyon Park to cool off after. There's a lovely splash park that feels good after the hot ride!! Finally, if you're going to bike to Okanagan Falls, you MUST stop at Tickleberry's for Ice Cream. For more information on this section of the trail, stop at the Penticton Visitor Centre but be warned that this part of the KVR doesn't show up on the maps they will give you. It's easiest to just follow the KVR line on Google Maps. I'm sure there are sections of the KVR that exist between Okanagan Falls and Oliver but we haven't explored them yet and I know that there is at least one missing link. We chose to just drive to Oliver and continue the trail south from here. The first part of the ride through Oliver was the best part of the ride because we went past the town skate park in Lion's Park and biked past the Kinsmen spray park. There was also a huge playground beside the spray park. All in all, the town portion was awesome for kids and a lot of fun! As we left Oliver, we rode through the country side, past farms and fields, and eventually came to the end of the pavement roughly 8 km from the end. The final part of the trail to Road 22 was on an old gravel road that paralleled the river channel. For more information on this section of trail continue to this link for the Oliver Hike and Bike Path. The Visitor Centres will also give you a map for this section of the KVR in your package of info. on the trails. Note that you will not reach the town of Osoyoos on this section of the KVR but will end at Road 22, approximately 12km north of Osoyoos. We didn't work with anybody in the Okanagan to assist with bike rentals or shuttles but should you wish to do so, there are many options. The Tourist Info. Centres will give you all of the information you need to do so. We finally did this big ride in the summer of 2016, riding all the way from Chute Lake down to Penticton, a distance of 44 km. To be transparent though, we actually skipped the first 4 km and started just below the lake. When we got to the lake we discovered that you had to pay to park there, and we got the impression that visitors were perhaps not welcome (overnight guests much preferred.) Fortunately, there was a nice parking lot just down from the lake and it was free. It was also a great starting point because I suspect we missed nothing in the first 4 km through the trees. Lots of loose sand on the section from Chute Lake to the Little Tunnel that is quite challenging for children on 20 inch bikes. I can't even imagine doing the ride on a smaller bike. It was not nearly as downhill as we'd been hoping for. Honestly, it felt flat. For a very loooooong time. It's much more downhill once you reach Naramata. It wasn't very exciting until we reached the Little Tunnel. Yes, we passed by the Adra Tunnel (currently closed to biking and in need of restoration,) and yes, we passed through Rock Ovens Regional Park where you can see rock ovens that the rail workers would have used for making fresh bread each day. Next we hope to do the full ride from Myra Canyon to Penticton (roughly 76 km in length) with an overnight stay at Chute Lake. Just waiting until our son is on a 24 inch bike for this one. I cycled the KVR as part of the Okanagan Trestles Tour - http://www.okanagantrestlestour.com/ There is now a 40km distance option which is something you may want to consider. Thanks Christine. That looks like a fabulous tour. Goodness! You biked right passed our home town :-) It's funny seeing pictures of trails and places so familiar to us in this post. Glad you enjoyed your ride. Next time you plan to bike the KVR, let us know. We'd love to join you for a stretch of it! Will do! Hopefully we'll be back next summer. I have read your post. We love camping. We either take the full on experience with a tent or hit a cabin, mobile home. We would be camping year round if we could. We never really have a plan when we decide to go either so that makes it all the more fun. It is awesome unplugging from the high speeds of life to be able to unwind with outdoor life.